When you a stay at Nest Hotel Kumamoto in Kumamoto, you'll be in the historical district, just steps from Ryukyu Islands and Former Hosokawa Residence. Featured amenities include complimentary wired Internet access, complimentary newspapers in the lobby, and dry cleaning/laundry services. Self parking (subject to charges) is available onsite. With a stay at BOOK AND BED TOKYO -KYOTO - Hostel in Kyoto (Gion), you'll be a 3-minute drive from Gion Corner and 10 minutes from Sanjusangendo Temple. Located in Shizukuishi, ONSEN GUESTHOUSE SAKAEYA is within a 15-minute drive of Lake Gosho Vehicle Park and Lake Gosho Park Family Land. The front desk is staffed during limited hours. With a stay at First Street Okinawa Yomitan-son Oceans in Yomitan, you'll be steps from Ryukyu Islands and a 3-minute drive from Yokuda Beach. Free self parking is available onsite. Located in Utoro, Shiretoko Village is within a 5-minute drive of Utoro Onsen and Oronko Rock. The front desk is staffed during limited hours. Free self parking is available onsite. With a stay at Hotel Crystal Palace in Hitachinaka, you'll be within a 15-minute drive of Hitachi Seaside Park and Fasion Cruise Newport Hitachinaka. Free self parking is available onsite. Located in Numazu, Hotel Miwa is within a 15-minute drive of Port of Numazu and Numazu Deep Blue Aquarium. Self parking (subject to charges) is available onsite. 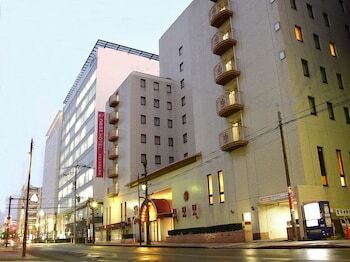 With a stay at Hisago in Kanazawa, you'll be just steps from Yuwaku Onsen and D.T. Suzuki Museum.